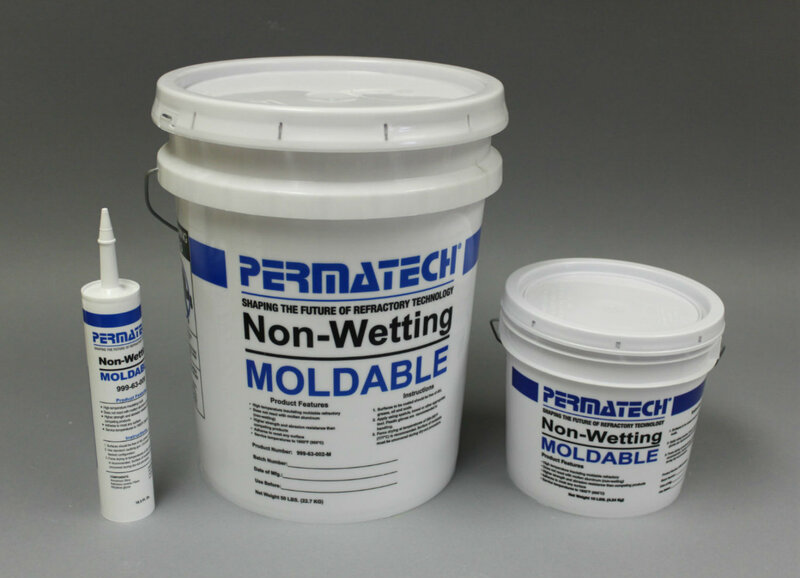 Permatech's Non-Wetting Moldable provides an easily formed, ready mixed composition for field applications in molten aluminum environments. Designed for use downstream from metal treatment operations, the refractory composition can be applied quickly and simply to make joints, troughs and other shapes, to patch existing refractory materials, and to coat metals as a shield against high temperatures. Permatech's Non-Wetting Moldable rated as "Excellent" in 72-hour cup test using 7078 alloy heated to 1500 degrees F. It continues to perform well up to its 1800 degree maximum-use temperature. It is reported that Permatech's Non-Wetting Moldable provides superior physical strength. Other features include high adhesion, excellent insulation ratings, and low shrinkage. 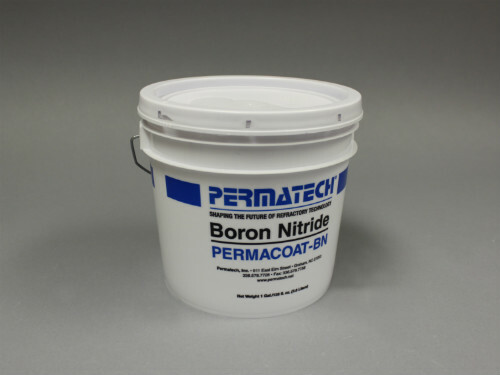 We also offer other refractory protective formulations like our Boron Nitride Coating PERMACOAT DEEP BLUE which is available in 3 different formulas to protect Troughs, Casting Tables, Filter Bowls & Boxes, Degassing Systems, and Spouts & Flow Control Rods. Our R-745 foam insulation provides a non-wetting safety zone to stop molten aluminum should it escape the primary refractory before it reaches the steel superstructure of the metal-containing vessel. The two-component foam expands as it sets, and flows into every available space to eliminate voids. Permatech's Non-Wetting Moldable rated as "Excellent" in 72-hour cup test using 7078 alloy heated to 1500 degrees F. It continues to perform well up to its 1800 degree maximum-use temperature. Non-Wetting Moldable available is 4 sizes: 10.3 oz tubes, 1 Gal. Pails, 5 Gal. Pails, and 55 Gal. Drums. Permacoat-BN takes the optimum proven molten aluminum release agent system of Boron Nitride and makes it much more economical to use. Permacoat BN can be utilized for countless applications within your aluminum casting operations and will help extend refractory life and provide a lasting non-wetting surface that protects against aluminum attack and attachment. Permacoat BN-A: Formulated for application by normal paint rolling or brushing. Permacoat BN-B: Formulated for application by compressed air spraying. Troughs, Casting Tables, Filter Bowls & Boxes, Degassing Systems, and Spouts & Flow Control Rods. R-745 foam insulation provides a non-wetting safety zone to stop molten aluminum should it escape the primary refractory before it reaches the steel superstructure of the metal-containing vessel. The two-component foam expands as it sets, and flows into every available space to eliminate voids. • The flow characteristics of R-745 make the slurry easy to pour or pump. Once dried, R-745 provides an extremely low density refractory barrier: 36lbs. per cubic foot. • Maximum use temperature is 2000 F. R-745 applications include insulating behind brick and monolithic refractories in filter and degassing vessels as well as casting tables. • R-745 contains alumina, calcium aluminates cement and dispersing agents. R-745 is supplied dry, and is mixed to form a slurry.